The story of The Crow and the Lamb was an incredible story, but the remainder of the book was dull at best. The only thing that surpassed my surprise was my disappointment. 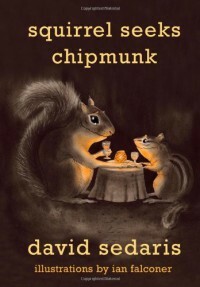 While it's possible that the other Sedaris works which I thought were wonderful and hilarious caused me to set the bar too high for Squirrel Seeks Chipmunk: A Modest Bestiary, but I doubt it.